His work can also be seen worldwide with murals in Japan, Germany, Switzerland, Amsterdam, South America and other countries. Case Maclaim’s exacting execution underlines the pictorial pureness and high narrative value. Walls covers the whole entrance to the new gallery space. Multiple rainbow hued digits walk across the wall in a piece called Miami Gardens from 2015. Case Maclaim – real name Andreas von Chrzanowski, born 1979 – started developing his technique in 1995 when he began using spray cans. The German born and raised artist is a founding member of the graffiti crew Ma’claim, which he founded along with fellow artists Akut and Rusk in 1999. The international group is considered pioneers of photorealistic art in the graffiti scene. Hands can express power, vulnerability, anger, peace signs, movement or several emotions at once. A hand held up with the palm facing you can mean stop. Turns it around and it beckons the viewer on. Each finger can have meaning in itself. The Wynwood Walls hands walk across the wall like a silent herd of elephants, leaving a colorful trail in their wake. 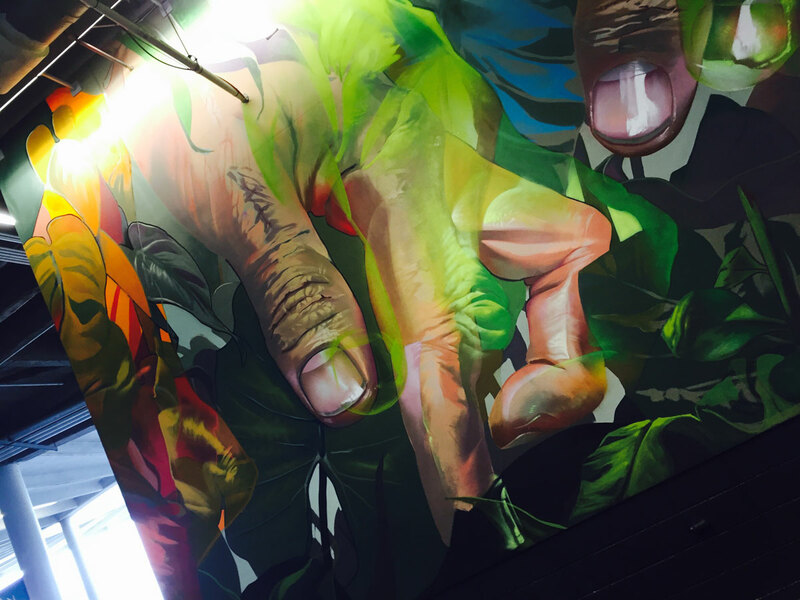 For Wynwood Walls’ 2014 program the Art of Collaboration, Case Maclaim was tapped to paint both a mural outside the walls and one for the Wynwood Doors, both of which feature his iconic hands. He later was commissioned to create a huge mural at the new Hard Rock Stadium in North Miami which has a tropical vibe with palm fronds filtered in between the fingers. The real beauty of this mural is that it exposes tens of thousands of people that attend football games and concerts to art they would never normally see. The Case mural is one of many that Goldman Global Arts was commissioned to curate for the huge stadium. It is billed as the world’s largest indoor museum show with multiple murals and artwork scattered on all floors of the stadium. Case Maclaim was born in 1979 and was raised in East Germany. He received a diploma in Art Restoration and Conservation at the Erfurt University Of Applied Sciences. Although he worked on his style from the time he started experimenting with spray cans, the story of Andres Von Chrzanowski’s role in street art really begins in 1999, when Akut (the male half of the Herakut duo) teamed up with Case and Rusk so the trio could start collaborating on mutual projects. Two years later, Tasso joined the group and the new street art collaboration came to be known as the Maclaim Crew. This group of young energetic artists went on to build a name for themselves by designing and creating some of the best photorealistic graffiti the street art world had ever seen. But from the beginning, as the Maclaim Crew was painting photorealistic images of body forms and portraits, CASE managed to stand out with his personal and surrealistic approach to creating art. His colors and details and imaginative images became a style unto themselves. Case’s visual vocabulary and iconography relies on the components of the human body that are abstracted from their origin and are given new narrative, that covers animalistic or mythic elements. This enables him to question many commonly found ideas about humanity, reinforcing them with strange and awe-inspiring images. These deep concepts and re-imaginings are only rivaled by the technical supremacy of this artist. Case Maclaim’s exacting execution underlines the pictorial pureness and high narrative value. He constantly makes creative waves on both the national and international street scene, with murals in over 20 countries. Not only are Case’s pieces unique in their subject matter, but they are brought to life through what can easily be called one of the most extraordinary techniques in all of the urban art. Andres Von Chrzanowski has traveled to over 20 countries by now, quite literally making his mark in each of them, leaving aerosol art pieces that depict a language understood by all regardless of the geographical location – after all, a hand gesture can tell a thousand words whatever language one observing it speaks. His work can be seen worldwide with murals in Japan, Germany, Switzerland, Amsterdam, South America and more. Andreas von Chrzanowski lives and works in Frankfurt, Germany.